Commercial and industrial toilets and rest rooms require hygienic hand washing and drying facilities. Consumers are ever hygiene conscious and require innovative bathroom solutions to reduce bacteria and keep clean. The need for efficient hand drying equipment is paramount to good hygiene practices and stopping the spread of infection. Businesses have a requirement to ensure that employees and consumers are given excellent hygiene standards to maintain good standards of health and safety. Using hand towel dispensers is one way businesses can maintain these standards. 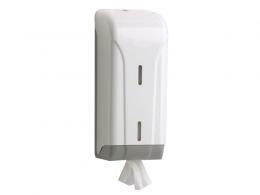 Our extensive ranges of hand towel dispensers are well manufactured safe and efficient. 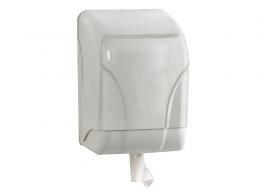 Our centre feed towel dispenser is a hygienic and durable unit. 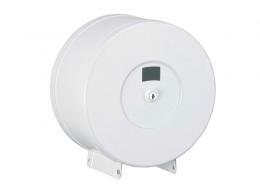 It is a smooth designed plastic dispenser with a secure locking device. One of the most stylish hand towel dispensers within our range is the Stainless steel hand towel dispenser which has been purpose built for centre fold and multi fold paper towels. To complement our range of hand towel dispensers we have the hand towel bin which is a quality receptacle suitable for high traffic use. The largest in our range of hand towel dispensers is the plastic hand towel dispenser which holds up to 750 sheets and has an indicator to allow paper levels to be checked with ease. All of our hand towel dispensers have been stringently checked and tested to meet with very high standards of health and safety. Whatever your hygiene requirements ensure you select the right option by browsing our full range of Hand towel dispensers today. There are a dozens of modern and stylish accessories available now for homes, offices and other workplaces. One of these modern accessories is a toilet roll dispenser that you can order at The Workplace Depot now. If toilet rolls are just kept loosely they tend to open up and cause litter around, thus making toilets and bathrooms look shabby and untidy. Lockable toilet roll dispensers now make it manageable to keep toilet rolls properly and neatly, without even being seen as they are kept intact in these box-like dispensers. 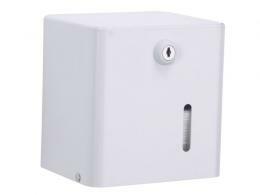 These dispensers have self-locking or key locking system so as to prevent waste and from falling out. The plastic toilet roll dispenser is made up of injection moulded plastic thus making it strong and solid. It has a self-locking cover; however a key also comes along with it. It can be used to keep both perforated and un-perforated papers. Toilet roll of a maximum diameter of 300mm can be placed inside it. It comes in three different variations of different sizes. The stainless steel toilet roll dispenser is made of 304 grade stainless steel and is of an excellent quality, very durable and neat looking. It has a storage capacity of 4.8cm and can hold a roll of a maximum diameter of 24cm. These lockable toilet roll dispensers are very economical and easily affordable, so buy now to give your toilets a modern and stylish look. For washrooms in commercial buildings and businesses, you need an economical solution for hand-drying. 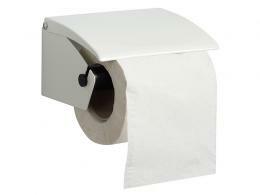 Stocking your washrooms with paper towels is not only expensive; it is also hard on the environment and wasteful. 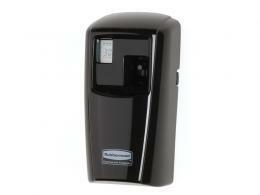 Solve all of these problems by purchasing hand dryers for all of your public washrooms. They’re also useful for employee washrooms, rest areas, and public washrooms where it just doesn’t make sense to spend a lot of money constantly restocking paper towels for hand drying. The Dyson Airblade Hand Dryer is a model that will save energy as well as money in the long run. It runs far more efficiently than regular warm hand dryers, using up to 80 percent less energy. Along with this, it uses technology that dries your hands in just 10 seconds – a high velocity sheet of air literally scrapes the water from your hands. An infrared sensor additionally detects whenever hands are placed underneath the dryer for touch-free operation. This hand dryer is made of durable polycarbonate material that will resist chipping and scratching, and it comes with an anti-microbial coating for additional protection from germs. The Dyson Airblade comes in two colours – grey and white. It’s truly a sleek, efficient model that will help keep your washrooms cleaner, more hygienic, and free of discarded paper towels. It also helps keep paper out of landfills and saves more energy than using standard dryers. Sanitary bins are a necessity in areas where sanitary waste is created – namely, washrooms, rest areas, and public toilets. With the sheer number of people that use them, these public areas can be hot spots for catching cold or flu viruses as well as other highly contagious illnesses that are spread through contact with surfaces like door handles and sink knobs. To prevent the spread of germs and bacteria, and to keep bathrooms clean and tidy in public buildings, businesses, facilities, and leisure centres, you need to invest in sanitary bins. The Rubbermaid 12 Litre Sanitary Waste Bin is the perfect solution for keeping a washroom neat as well as maintaining a hygienic environment. The low height and slim design of this model means it will tuck into washroom cubicles without taking up a lot of space. Having a small bin in each cubicle helps you avoid having to crowd bulky bins into an already restricted space. This sanitary bin also features a hands-free design, as it’s operated via a convenient foot pedal. For your public or employee washrooms, whether they’re located in your business, office, public rest area, or public building, you need to accommodate every person who may walk through the doors. This means thinking about the needs and security of elderly or disabled customers, employees, or members of the general public. For them, hand rails and grab rails are a helpful necessity for getting around and about. The Workplace Depot will help you make sure you purchase the right kinds that are sturdy and solid. The Straight Grab Rail is the perfect way to provide basic stability for anyone who needs its support. It’s made of powder coated steel with a thermoplastic coating. It anchors to any wall and will give appropriate grip and leverage for the disabled or the elderly. Our Angled Grab Rails are available in two variations, including a Right Angled Grab Rail (sometimes called a 3-point bar). These can be used in washrooms near a toilet or a shower area – any place where assistance might be needed to help a person move from a sitting to a standing position, and vice versa. These are strong and durable rails that will provide adequate support for anyone who needs them. The Shower Seat is made of a powder coated steel tube with a vinyl cover. It folds up for convenience in smaller spaces and is perfect for disabled/handicapped shower stalls. Babies are beautiful to behold, but babies are babies and need to be changed on a regular basis – often when you are having a nice dinner in a restaurant or just out shopping somewhere. For this purpose, most businesses and public areas are required to have baby changing stations installed at certain points to make it convenient to change their little darlings and keep them clean, dry, fresh and happy. This product is an ideal solution to this major need that every public-access building or facility has. Stuffed with useful features, this baby station is designed with convenience, safety and hygiene in mind. The horizontal style baby changing station is a safe and ergonomic design that meets all standards of ASTM or EN 12221-1 and has an anti-bacterial protection which inhibits the growth of bacteria that causes odours and stains. The station is constructed of polypropylene and has a large, deep bed with an adjustable belt to keep your child still and avoid them rolling or falling off the bed. The easy one handed folding operation allows for safer opening and closing, proving great space optimization. These are the paper liners for use with the baby stations that keep things hygienic. This product can be used in any indoor semi-private or private setting within a public space, such as in a restaurant or on trains and aircraft or even on a boat. The fact that this is such a universal product – after all, there’s no place on earth that doesn’t have babies – it can be used wherever there is a wall to mount the product. The convenient features on this product make it an essential utility item for any public facility – museums, theatres, hotels and any other place where babies may be expected to make an appearance! It is definitely a must for areas that cater specially to infants and toddlers. This product is ideal for business owners who cater to the general public and need to provide some sort of changing facility for guests with babies. The versatility of such a product dictates that it is suitable for anyone who needs to offer courtesy facilities to their guests and visitors. Places where parents take their children should necessarily have such a product installed – and one that is hygienic and convenient to use. This ideal product is collapsible and affords easy operation with a single hand – an absolute must when there’s a baby in the other! The Workplace Depot’s bathroom accessories come with free delivery, not to mention a standard one year warranty that also includes parts as well as labour. Order today and make your bathrooms more environmentally friendly and efficient.